In order to work with non-linear relationships in Further Mathematics, data transformation is applied. This involves changing the scale of one of the variables so that it is compressed or stretched to create a straight line. In this course, three main transformations are regarded. Above is a representation of how the data points are stretched or compressed. 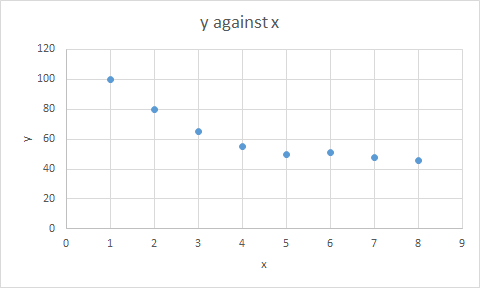 The graphs show a linear line being drawn by transforming the x-axis. 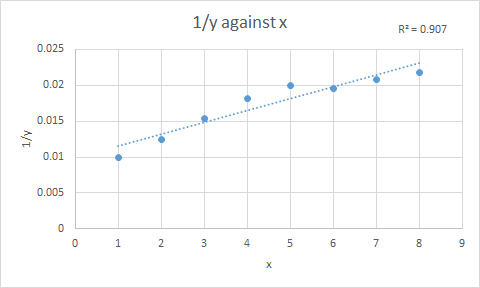 Notice how the x-axis has a different scale. 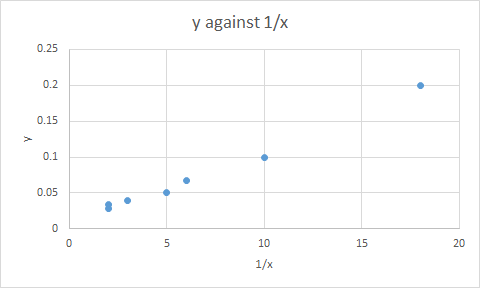 The following data from Table 1 was used to construct two separate graphs (Graph 1 & Graph 2). 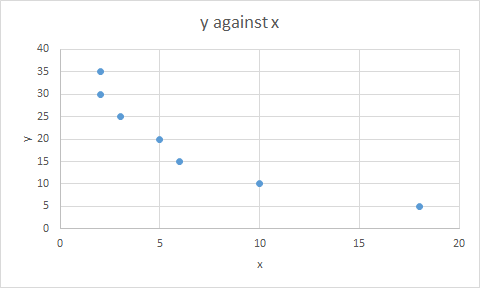 By observing the two graphs, it is obvious that the data points represent a more linear pattern when a reciprocal transformation has been applied to the x-axis. In the same way, data can be transformed in the y-axis. 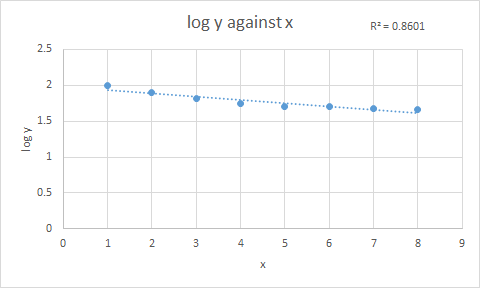 Notice how, by changing the scale on the y-axis, the data values were able to demonstrate a linear relationship. 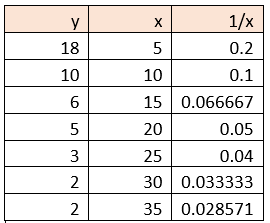 The data in Table 2 shows the values that were applied when creating Graph 3, 4 and 5. Displayed is also the value in order to show which transformation was a better fit. The value of is the greatest with the 1/y transformation which signifies that this is the best transformation to apply. 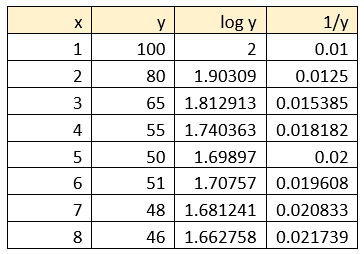 By comparing the shape of the data points to those in this table, the possible transformations can be experimented with. 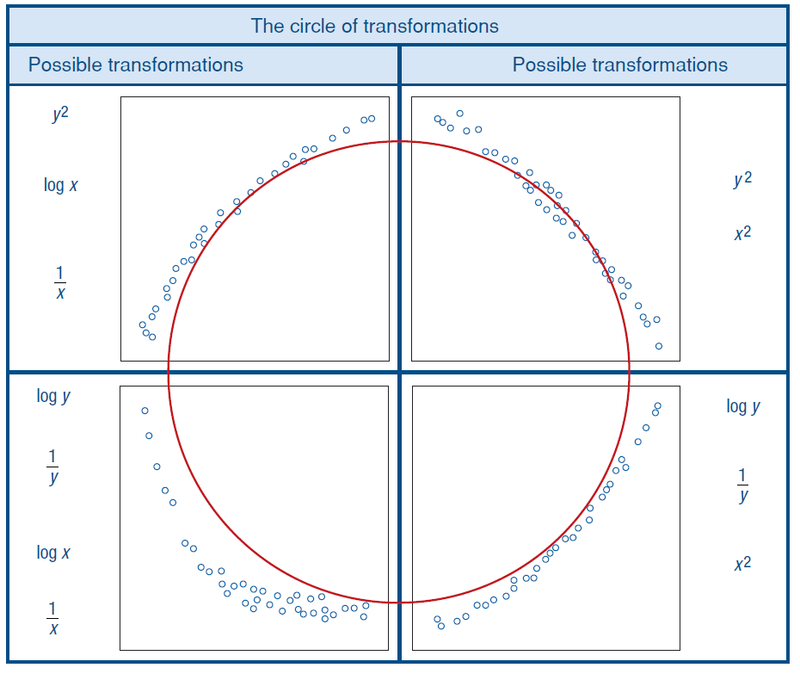 After applying all of these transformations, the coefficient of determination is observed in order to determine which of the transformations is most appropriate. Essential Further Mathematics Units 3 & 4, 4th Edition Enhanced, pg 190.